This software is able to convert complete database file of lotus notes NSF to Outlook PST file like emails, calendars, tasks, contacts etc keeping all the meta properties intact. Lotus Notes to Outlook converter software gives options to users for either migrating mails and contacts into a single pst or the names.nsf can also be saved in different pst file. For security purpose, there may be many situations in which Notes users may be needed to encrypt their messages. 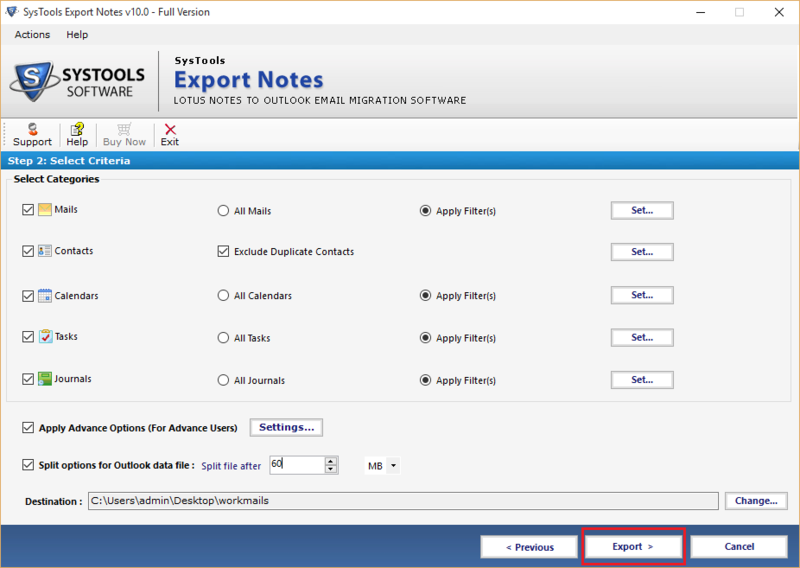 Lotus Notes to Outlook tool has option to remove encryption from those mails and can export nsf file to pst easily. This tool allows the users to map the folders from lotus notes with the folders of Outlook PST file. This features helps the users to saved specific data in a specific folder. This tool provides you the option to apply filters on various items of lotus notes like users can apply date based filter on emails, calendars, contacts, tasks, journals and can also filter out duplicate contacts. NSF to PST Converter has the option to split the exported pst file into different small size for managing it easily. It is needed to be break as large pst file is much prone to be corrupted. NSF is called Notes Storage Facility. It is the database file of Lotus Notes which contains all emails, calendars, tasks, journals etc. It is created as username.nsf file, notes contacts is saved in file named as names.nsf file. All users ID and password is saved in a user.id file. Why does user need NSF to PST conversion tool? There may be different situation where users may be need to switch the Lotus Notes to Outlook platform, for that they need to convert Lotus Notes NSF database to Outlook PST file. If a user is working on Lotus Notes platform in any organization and now the organization have decided to switch their mailing platform which MS Outlook. In that case, user can′t access that NSF file in Outlook, so they will need the NSF to PST Conversion tool. If a person is switching his/her job and previously he was using Lotus Notes for mailing, so to get lotus notes email in Outlook, user will have to export NSF File to PST. Lotus Notes has complex graphical user interface which requires more technical knowledge to access its all features. Because of simple GUI and its popularity, users are getting attract towards it. 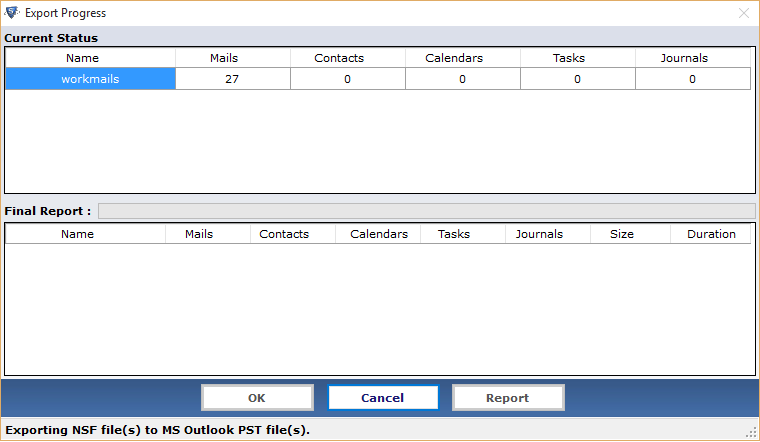 So by migrating Lotus Notes NSF to PST they can easily continue with their previous data in Outlook. Step 1: Run NSF File to PST Converter and Browse for Lotus Notes Files. Step 2: Click on Select Folder to export the Specific Folder & save contacts in seperate PST. Step 3: Initiate the conversion by clicking on Export Button. Step 4: Save the Export Files Report by choosing Save Report option. This video shows the entire features of NSF to PST Conversion tool. User can easily understand the working of tool and its complete features by watching the below given video. I have a NSF file containing lots of mails and many of them is encrypted. Now I want to convert those NSF mails to PST file. Does this tool support? Yes this NSF to PST converter is a best tool to migrate your NSF encrypted mails to Outlook PST format. It convert encrypted nsf to pst by removing encryption from your emails. Can I save my old NSF file into MBOX format using your software? No, Convert NSF Software only migrate NSF file to PST with the option to save NSF contacts in separate PST file. But it cannot convert your NSF file to MBOX format. Is this tool is suited to migrate NSF to PST Outlook 2016? Yes, NSF to PST software is capable to export NSF file to PST in Outlook 2016, 2012, 2010,2007 etc. Is there any limitation on NSF database file size to convert NSF to PST? 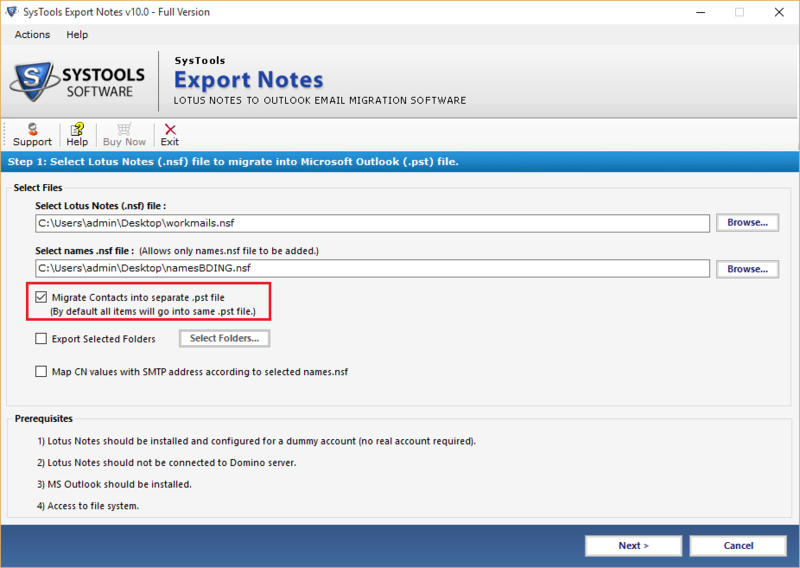 There is no size limitation for exporting Lotus Notes NSF to Outlook PST file format. Does this tool supports the conversion of corrupted NSF file? No, NSF to PST Converter does not support the corrupt NSF File to be exported in Outlook data file. I have some protected NSF file. Can I still Migrate Lotus notes to Outlook file format using your tool? If your Lotus Notes file is password protected then use the user.id file and password (which is associated with it) file to open it. After file opening, use our tool for exporting NSF to Outlook by giving the password. Then proceed further with the migration procedure. I would like to say thanks to the development team of Intrigua Convert NSF tells how to import lotus notes .nsf file to Outlook solved my problem to convert ibm notes to Outlook. 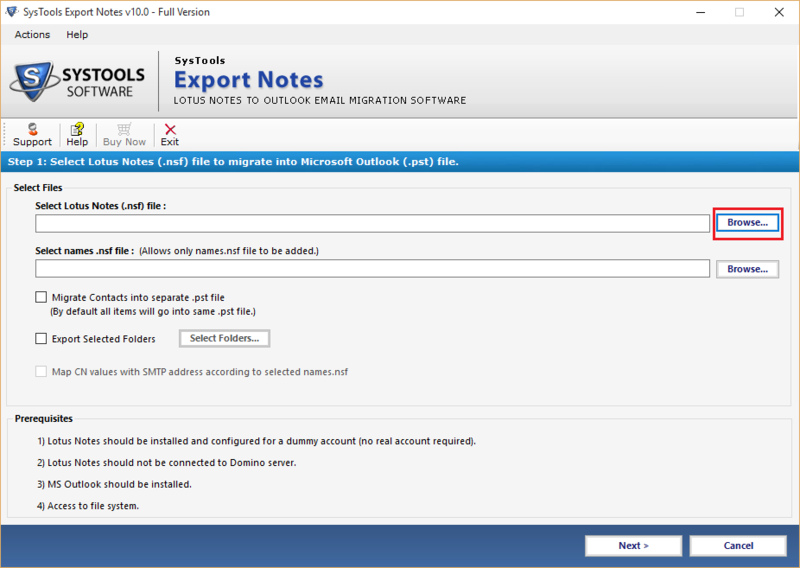 Now I want to suggest this tool to all users who want to migrate Lotus Notes database to Outlook. This is a best ever solution to know how to migrate emails from lotus notes to Outlook. There is no limitation on file size to convert Lotus Notes NSF to Outlook PST. It converted my encrypted emails which was locked with some password which i forget. Thanks for developing Lotus Notes NSF to PST converter.